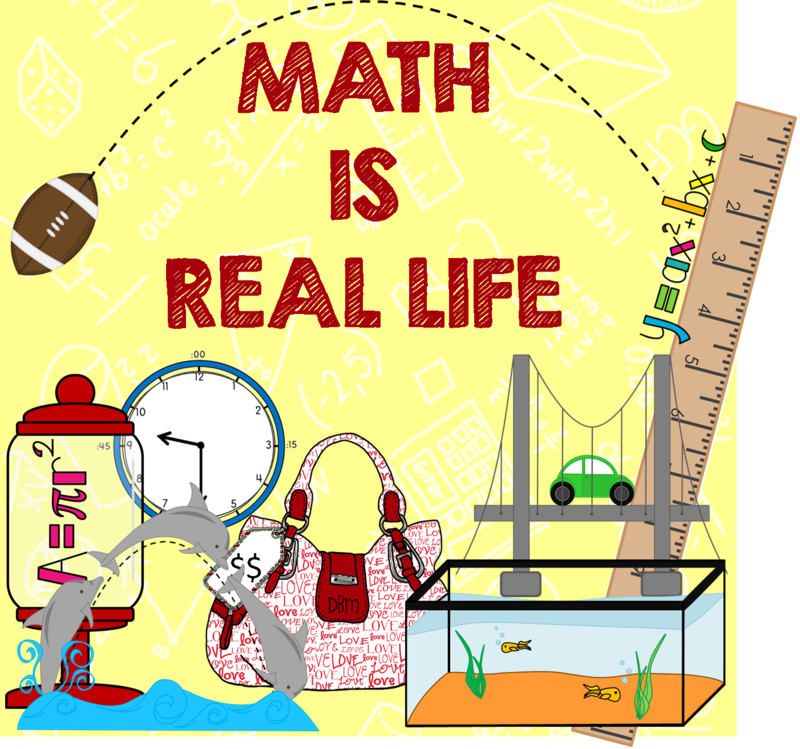 Math IS Real Life – October 2013 Edition: apples, apple, everywhere! It’s the first Wednesday of October which means it’s time for our new linky – Math IS Real Life. August and September were super successful! We’ve even created a Pinterest Board of all the posts that were linked up at the end of August! We will continue to pin them each month to keep all of these AMAZING posts in one location! Anyhoo…. as soon as I heard what Septembers Ladies Learn shindig was, I KNEW I had to blog about it for Math IS Real Life! First, I must mention that when Morgan entertains…. well, she goes over and beyond and then beyond some more! We all knew she was having an apple theme… but we had no idea what we were in store for! Upon arriving, we were greeted with an awesome table full of goodies for us to take home! She made us each a homemade caramel-cream cheese dip for our apples, as well as a baked orange full of spices. We had an awesome lunch of Waldorf salad, pork, onion and apple kabobs, apple pie “fries”, apple bourbon barbeque sauce, and homemade caramel dip. Once we asked what we would be learning about, she showed us this amazing apple press. Then she pointed to the apple and quart jars…. APPLE CIDER! I was so excited to take pictures of this entire process! I do hope you enjoy the pictures as much as I enjoyed the day! The first step in the apple cider making process was to rough chop the apples. We rough chopped 8 bags of local apples plus another large basket. The basket carried about 3.5 bags of apples. All-in-all we had about 175 apples. Next, we added the cheese cloth loosely to the barrel. We then took our positions…. …for the record you don’t use both cranks at the same time but this pic was tooooooo cute to not post! Sister-in-law, Morgan on the right and her best friend Mandy on the right. The most efficient way to do this process was to use all 5 of us. One person was in charge of filling the back container with apples. You throw it all in! Apple, core, seeds, skin…. all of it! Then, someone, with lots of strength, cranked the handle to turn the churn where the apples were placed earlier. While the cranking was taking place, two people held on to the cheese cloth so that the apples were contained without any spills! Once 2 bags worth of apples had been cranked, we laid the cheese cloth over the bundle of apples and added the flat press on top of the cloth. Then someone stood behind the machine and cranked the top piece around in circles as it pressed down. If you look close you can see the juice oozing out the bottom. At this point, someone else sat at the base and held a quart jar under the flat cookie sheet. If you look in the top left of the picture you will see a small drilled hole for the juice to drop into the jar from. The person holding the jar had to be ready to transition another jar quickly so as not to lose any apple cider! We repeated the process for all 11.5 bags. Taking turns at each of the positions. A close-up of the cider dripping into the jar. It actually flows rather quickly, I just asked them to slow it a bit so that I could get a good picture! 11.5 bags of apples later we had 8 quarts of apple cider. So other than the obvious, quarts… where’s the math? Well, Morgan is an awesome estimator! Originally 8 ladies had signed up for the Ladies Learn outing, for various reasons only 5 were able to attend. Morgan had to estimate the number of apples per quart needed… she was able to take her past experiences with campers and make a great estimated guess. But, what would she do if she didn’t have an background knowledge? Proportion is tricky with juicing a fruit because of all the variance in the fruit itself. Some apples are juicer, some are larger, some are smaller. While all the bags are weighed, sometimes there are differences in the amount of juice you get from that bag – was the same amount of force used? was the full amount of juice extracted? too many factors to have a perfect proportion. However, you can use this data to get a pretty decent idea of what future batches will look like based on a linear regression. Knowing that, I have a pretty decent estimate on how many apples to buy to make apple cider based on the amount of people attending my party. So, making a table based off of that linear regression, you can see if I want to make 15 quarts (almost 4 gallons!) I would need 23 half-peck bags of apples. Knowing the equation of the line for the data can make your estimation much more exact! If you don’t have a TI-83 calculator handy, you can search for “linear regression calculator” on your search engine of choice. I used this one. Categories: #mirl, computation and estimation, fractional reasoning, math is real life, mathematical engagement, mathematical reasoning, and mental math. I can only imagine how delicious that fresh apple cider tasted! Love the old-school apple press! Where did she get it? We just planted 3 apple trees this year so I will be lucky to get 1/2 a peck(??) next year. Maybe there is apple cider in my future. It was sooooo delicious, Kim!! Morgan is the director of an educational camp, and they make apple cider ever fall with their kiddos. You can’t imagine how sweet it is, even with no sugar added! I kind of want to make some right now… it’s cold and rainy and I think heating some apple cider up on the stove and adding in the mulling spice would be so tasty and cozy! Jamie, I love how you can see the math in this! I think the post turned out to be really wonderful. I thought I was planning a nice lunch with friends but in fact I was planning a math lesson!